Post-Inflammatory Hyperpigmentation: P.I.H. is no piece of P.I.E. PIH stands for post-inflammatory hyperpigmentation, a condition people most often call “dark marks,” or “dark spots”. The problem occurs when a pimple, bug bite, or any other type of inflammatory issue causes the skin to produce excess melanin, leaving spots or large patches on the skin. PIH can be triggered by even the most minor lesions, and can appear on any part of the body. As a Physician Assistant in Dermatology, I see PIH as a primary concern, or at the very least, a secondary concern for one in every two patients. No two instances should be approached exactly the same way, but there is one piece of advice I give all my patients – wear sunscreen. No matter your complexion or what the weather is like outside, sunscreen should be worn to help protect the tone and brightness of your skin. Sunscreen does so much more than fight those nasty cancer-causing rays! It also prevents photo-aging, while reducing the production of age spots. This photo should give you a compelling reason to wear sunscreen. 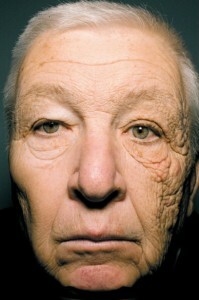 It shows an extreme case of unilateral dermatoheliosis: UVA rays transmitted through the window of the patient’s delivery truck severely damaged the skin on the left side of his face during the 28 years he spent driving on the job. At my office we have several treatments for PIH at our disposal, allowing me to offer my patients different options when reviewing their skin tone and texture. The chart below shows the typical, step-wise approach I share with patients, including down-time and cost. Sunscreen is the only treatment that I recommend across the board. My advice is to not move forward with any dark mark or rejuvenation procedures without first committing yourself to using quality sunscreen on a regular basis – otherwise, you’ll simply be wasting your hard-earned money. And I don’t know about you, but to me that hurts. Bear in mind that there are many different ways to treat PIH, and while this doesn’t completely encompass the entire range of available options, it does touch upon some general alternatives most dermatologists, estheticians, and cosmetic doctors offer at their practices. Each option requires its own regimen and follow-up care, but depending on which area of the body you’re concerned about and the price you’re willing to pay, any of these treatments can contribute to restoring and preserving your skin’s clarity. Left: melasma spots. Right: solar lentigos. Some of the most dramatic results I’ve seen have been for melasma (typically a hormone-supported hyperpigmentation disorder emphasizing broad areas of hyperpigmentation, generally on the cheeks and forehead) and solar lentigos (sun or liver spots or spots caused by chronic photo damage). Several peels and non-ablative laser sessions later and my patients’ pigmentary issues were resolved – not subtly hidden, mind you, but actually resolved. If you suffer from post-inflammatory hyperpigmentation, talk with your provider today about your options for improving your skin’s clarity. Megan Steel received a Master of Science degree in Physician Assistant Studies degree from Seton Hall University in 2013, and a Bachelors of Science Degree from Fairfield University in 2008. She is presently the acting treasurer of the New Jersey Physician Assistant Foundation, which supports an annual scholarship to Physician Assistant students and aids local charities. At Image Dermatology in Montclair, NJ, she works closely with Medical Director Dr. Jeanine Downie to help patients achieve their aesthetic and medical dermatology goals.